“Bonaventure” was performed on Thursday 14, Friday 15 , and Saturday 16 May, 1953, at the Theatre Royal. Townsville Theatrical Society's second play this year, 'Bonaventure,'' which opened for a three-day season in the Theatre Royal on Thursday night, was marked by the excellent performance of Joan MacKenzie as Sister Mary Bonaventure. This was her first major role in Townsville, she played the part with exemplary skill, making good use of her voice. 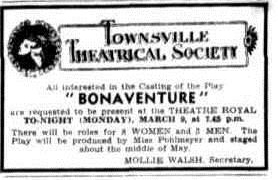 Written by Charlotte Hastings, 'Bonaventure' was of added interest to Townsville theatre-goers as the film 'Thunder on the Hill.' which is based on the stage-play, had not long before been shown in local picture houses. It was interesting to note the changes Hollywood had made to this skilful play. Producer, Miss G. Pohlmeyer, tackled the difficult castle setting with great ingenuity, and must be praised for her commendable effort. The two character parts, those of the half-wit Willy and his mother, were capably played by Robert Jackson and Lettie Mills. Lettie Mills, however, seemed to forget her fellow actors, and was apt to make addresses to the audience. As the young girl wrongly convicted of murdering her brother, Norma Jefferies gave an effective portrayal, and she was careful in not over-emphasising her character's hysteria. She conveyed to the audience the bitterness in the mind at a young girl about to meet the gallows. Barbara Chandler was very reserved and cultured with her acting as the Mother Superior, and was well cast for the part. Her whole nature on stage was that of a reverend mother. The part of Dr. Jeffries, who is eventually found out to be the murderer, was well taken by Jack Taylor, appearing in Townsville in his first major role. John Reid turned in a fine performance as the sergeant accompanying the 'murder ess' to the death cell, and he was capably supported by Mollie Walsh as his police woman assistant, Miss Pierce. The parts of the two nurses were taken by Judith St George and Mary Summerfield. The latter responded cleverly to the authoress' version of a cynical woman. Barbara Mclntyre's actions were natural. The play, according to Miss Pohlmeyer, was an experiment in dress and setting. Beside the difficult castle set, the producer had to cope with the unique habit of a French nursing order, which she did admirably. ‘B o n a v e n t u r e' will be staged again to-night and tomorrow night in the Theatre Royal.